Take a minute to imagine a world in which you don’t need expensive gaming hardware to play the next big budget release. A world where all you ever have to do is open up the Chrome browser, select a game you’d like to play and then have it instantly begin without a lengthy download. Well, that will soon become a reality when Google’s cloud gaming service, Stadia, is launched. 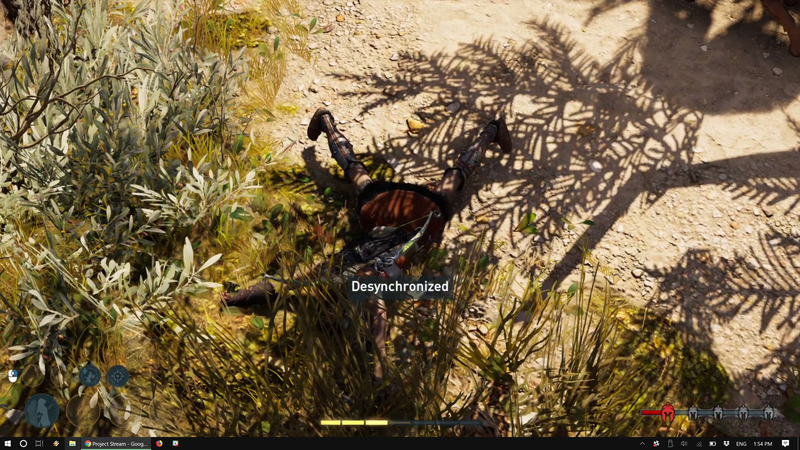 From Chrome tab to 4K, 60fps game, in five seconds. No installation required. Ever. Google promises that Google Stadia’s cloud computing power is the equivalent of a console running at 10.7 GPU terraflops, which is more than the PS4 Pro and Xbox One X combined. If Google delivers on this promise, then it could be a total game-changer – both figuratively and literally. At launch, Google has promised that Stadia will support desktops, laptops, tablets and smartphones – without the need for a hardware box, instead running on Google’s own data center. We got our first taste of the service during an extended beta that ran back in 2018, and now it’s been fully revealed at GDC 2019. There’s still much to learn as Google’s Stadia rolls out, but based on what we played last year, the renamed Project Stream serves as an impressive showcase of what the future of cloud gaming could look like, flipping the video game industry as we know it on its head. What is it? Google’s big move into gaming – a ‘Netflix for gaming’ streaming service that’s a true console competitor, one to rival (and potentially lead) the next generation of game-play. How much will it cost? No official details yet – it remains to be seen whether you’ll need to pay for individual games, or pay for a subscription pass, or a combination of both. 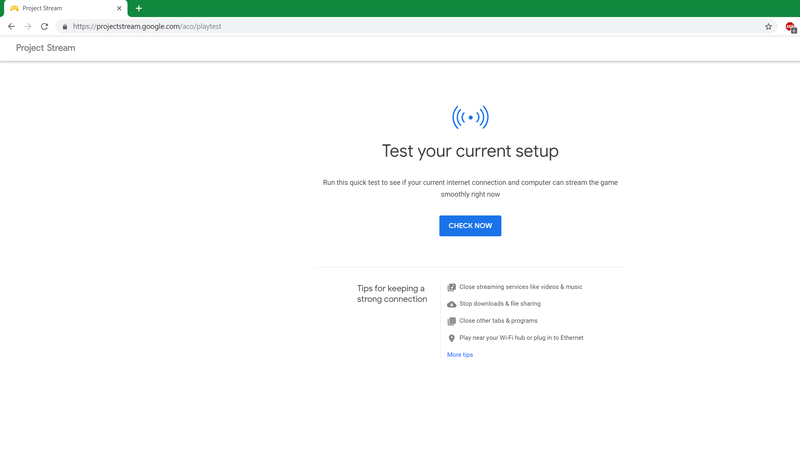 Good news: as long as you’ve got a stable and fast internet connection, and you’re using a recently desktop version of the Google Chrome browser, you’ve got all you need to get started with Google Stadia. 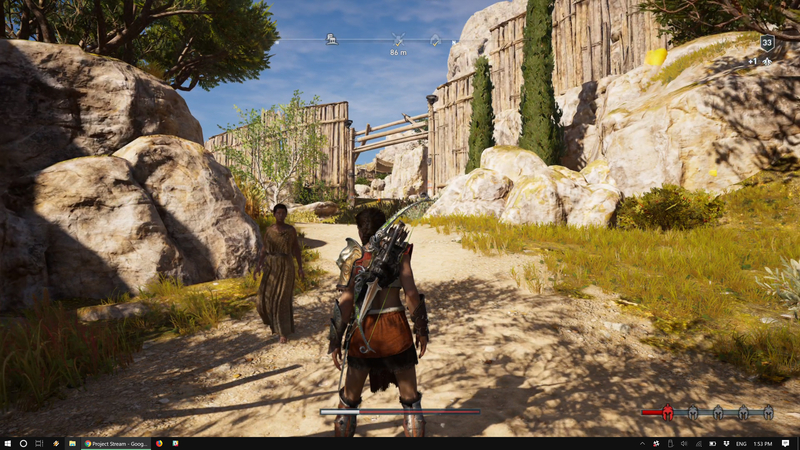 Getting started with a videogame on Stadia is as simple as opening a new tab up in Chrome and going to the service’s Stadia.com homepage, or even jumping from a YouTube video link about the game. The limits of Stadia are still being detailed, but Google has stated that Stadia will eventually be able to scale up to 8K / 120+fps frame rates, with 4K/ 60 fps play as the norm. That’s way above the standard bar for quality PC gaming. What you’re effectively doing here is opening a new tab that pipes all your inputs to a high-end gaming PC that streams back the visuals and audio to your computer screen. This system is simpler than some others, which set you up with a virtual desktop that then remotely runs Steam, Origin, Battle.net, or what have you. Stadia will also work well with Google Chromecast, which means you’ll be able to stream its games straight to any TV using Google’s streaming dongle, not to mention phones and computers. 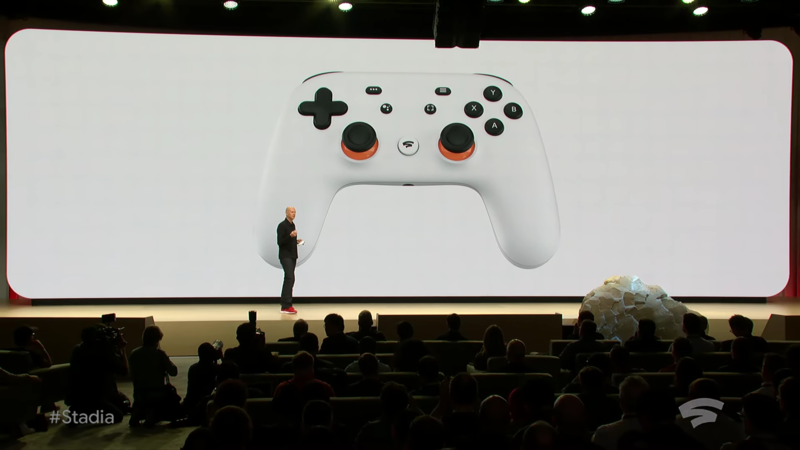 You’ll be able to use keyboard and mouse or a gamepad to play Stadia, and Google’s Stadia gamepad, a brand new piece of hardware, seems particularly smart. First off, the issue of latency – the gamepad itself connects directly to Google’s cloud, which take a few of the steps out the data transfer chain, reducing the lag between your inputs being registered by the game. It also has a dedicated Google Assistant button, which Google claims will be loaded up with information on the title you’re playing, offering tips when needed, or allowing you to access special in-game features from developers. In addition, it’ll support cross-platform multiplayer – so long as the other major game players want to take part, of course. 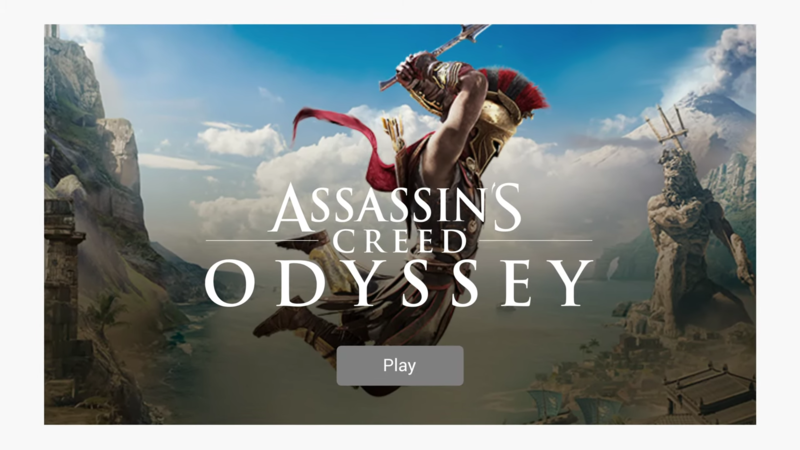 Through the Project Stream beta, the only available game was Assassin’s Creed Odyssey. While this didn’t give us much idea of what games Google will offer in the future, it did give us a good idea of what games Google’s Stadia could be capable of offering. In addition, id Software confirmed Doom Eternal is coming to the Stadia – with the team only taking a few weeks to transfer the title onto Google’s cloud streaming service. id Software’s Marty Stratton revealed Doom Eternal is capable of running at 4K 60fps at native HDR on Stadia. Games with a major online focus may have dicier prospects on Stadia. Since competitive online games are often fast-paced and require split-second reaction times, the extra latency introduced by streaming will likely be an issue for serious competitors. But Stadia looks better placed to beat this issue than other similar services, with infrastructure that no-one else has in terms of fibre optic cabling, and a Wi-Fi controller that connects directly to Google’s cloud. That could mean online multiplayer titles such as Fortnite supporting thousands of players rather than just hundreds. A recent Chromium update also added support for Nintendo Switch controllers to Google’s browser, so it looks like we could be getting more than just streams of PC releases. Google also announced the launch of Stadia Games and Entertainment. This will be a new arm at Google, with the sole aim of designing games exclusively for Google’s game streaming platform. As well as Assassin’s Creed Odyssey, Ubisoft has indicated a few upcoming games will also make it on to Stadia when it’s released, including multiplayer motor-cross game Trials Rising, naval warfare game Skull and Bones, as well as strategy game Anno 1800. Google Stadia will also allow for developers to implement split-stream local couch co-op easier, through Stream Connect. This should allow players to not only view but interact in each other’s worlds. The big focus here is on designing a system that’s both easy to play and easy to show off to your friends. 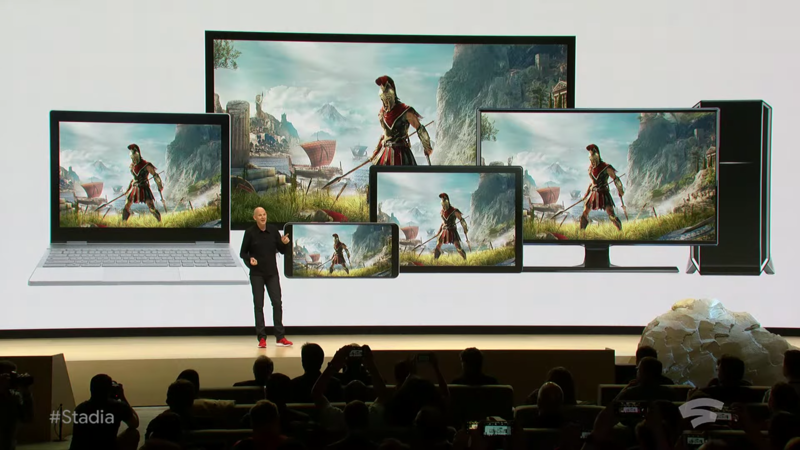 To that end, Stadia will send both a 4K signal to both your device and to YouTube simultaneously, allowing you to record what you’re doing. The last feature Google showed off was called State Share – i.e. the ability for you to share any spot in your adventure with anyone via a Google link. One use case would be that State Share would allow you to record your spot in a tough boss fight and challenge your friends to beat it. If you’re stuck, either in your game or your friend’s, Google Assistant integration will allow you to access guides and walkthroughs on-demand.